Krystal Clean Nail Fungus Treatment is an antimicrobial/antibacterial solution used to kill fungus and bacteria that cause nail fungus. On a website for Krystal Clean Nail Fungus Treatment, the cost of this product is listed as $8.95. I found no mention of a Money-Back Guarantee for Krystal Clean Nail Fungus Treatment. Krystal Clean is safe on skin and nails with no harsh acids, oils or alcohol. In addition, can be used with the addition of artificial nails and nail polish. 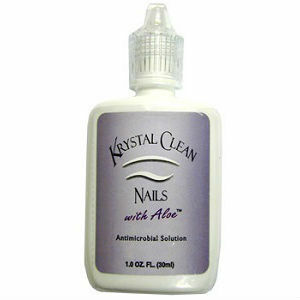 Krystal is a antimicrobial/antibacterial solution used to kill fungus and bacteria that cause nail infection. There is very little information available about Krystal Clean Nail Fungus Treatment and there is no money-back guarantee. While inexpensive, it is an unknown. Jack Stevens	reviewed Krystal Clean	on October 6th	 and gave it a rating of 3.